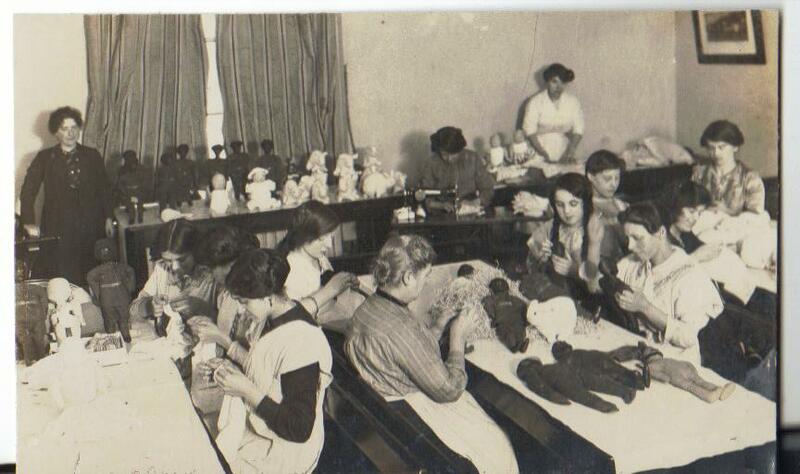 We are familiar with the toy factory opened during the First World War by Sylvia Pankhurst’s East London Federation of Suffragettes at Bow in London’s East End, but how many of us know that another suffrage society, the Women’s Freedom League, operated a similar factory in Hackney? With the outbreak of war the various suffrage societies had recognised the need to provide employment for women put out of work as dress-making establishments suffered a sudden drop in demand. In the autumn of 1914 the thoughts of the women of the nation were, unsurprisingly, on other than on sartorial matters. The New Constitutional Society, for instance, hoped to help destitute dressmakers by opening a war-relief work-room , organised by Kate Frye (for details see Campaigning for the Vote – to see Romola Garai as Kate Frye in that work-room as realised by ITV see here ) . The NCS opted to make clothes. The ELFS and the WFL, however, decided to take advantage of the gap in the market that had opened now that toys could no longer be sourced from Germany, hitherto the main supplier of presents for British children. But where in Hackney was the WFL toy factory? It looks from the photograph as though it was located in a private house, probably comprising only a couple of rooms. This wasn’t a factory on the scale of Lesney – Hackney’s other – once-famed – toy maker. Update: Reading Jennie Churchill’s Women and War Work I’ve discovered that the toy factory was in South Hackney…but have not yet pinpointed a road. Interestingly, the photograph at the head of this blog post came from a postcard album compiled by Louisa Thompson-Price, who is named as a contributor to the chapter that mentions the WFL toy factory. How long was the factory in production? Mrs Sarah Ann Mustard (1864-1936), of 48 Moresby, Upper Clapton, had been president of the Hackney branch of the WFL from about 1910 and it is she who described the work of the factory at a WFL meeting- in Mayfair – on 26 March 1915. However, the WFL’s newspaper,The Vote, then goes decidedly quiet on the factory and its products. It is especially curious that none of the reports of the many fund-raising bazaars makes any mention of Hackney-made toys for sale – nor does The Vote carry any small ads for its wares. And yet the WFL had felt it worthwhile to ask Fleet Street photographer, Barratts, to come along to their ‘factory’ and take a photograph. This doesn’t seem to have been published in The Vote, but, fortunately, was issued as a postcard – allowing us a glimpse of one all- but- forgotten War Work effort with, in the background, an array of its products. This entry was posted on September 22, 2014, 1:22 pm and is filed under First World War, Suffrage Stories. You can follow any responses to this entry through RSS 2.0. You can leave a response, or trackback from your own site.